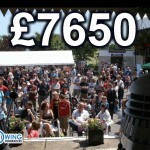 We are very pleased to announce a staggering £7650 was raised for FORCE and C.R.Y. at the Exewing Sci Fi event, Pecorama, Sunday June 30th. Thank you to all who helped, supported and attended the event, as always it is greatly appreciated. A great selection of photos from the event can be found at our dedicated Flickr account here. The Exewing Fundraisers bring you a jam-packed charity event where you can meet the stars from Star Wars and Doctor Who. *The Schedule is subject to change, please listen to announcements, or ask at the Exewing Tables. SCI-FI NATURE TRAIL. Take a stroll through the ‘Wildway Park Walk’ and see how many Sci-Fi characters you can see, mark them on your sheet given to you upon entry. SPOT THE MONSTER. Take a look in the ‘Model Railway Exhibition’, shrunken Doctor Who monsters are hiding inside, see if you can find them! Use the sheet given to you upon entry. BOBA’S BOUNTY HUNT. Darth Vader is hunting an important member of the Rebel Alliance, can you find out who it is before Boba Fett does? Look for the clues hidden all over Pecorama, use the sheet given to you upon entry. 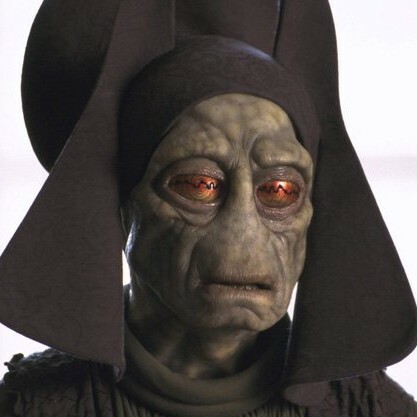 Boba’s Bounty Hunt and Spot the Monster Prize draw, see sheet for details. FANCY DRESS COMPETITION. On the main stage, 12.30pm, Entrants please arrive 15 mins before. Two catergories Child (16 and below) and Adult (17 & above), prizes to be won. UKCM / UNIT Shooting Range. The United Kingdom Colonial Marines and U.N.I.T. need you, are you up to defending the Earth and beyond? Test your shooting skills and see if you are made of the right stuff. EXHIBITION. See our fantastic display of Props, Costumes & Models from many Sci-Fi TV Shows and Movies, many are the actual screen used items. CELEBRITY AUTOGRAPHS. Our special Guests will be signing autographs and selling photos on the main stage, a separate fee will be payable for these. (Please note some Guests may have to leave at 3pm, listen to announcements). COSTUMED CHARACTERS. Keep an eye out for the many characters and monsters wandering around, most have been fed so they should behave themselves! Great Photo opportunities. COSTUME GROUP PHOTO SHOOTS. 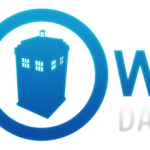 The UKCM, Dorset Troopers and Charity Sci-Fi Costuming Groups will be gathering in numbers for a short time at differnt times and places to offer a fantastic group photo opportunity, see schedule for the times and places. RAFFLES/TOMBOLA. 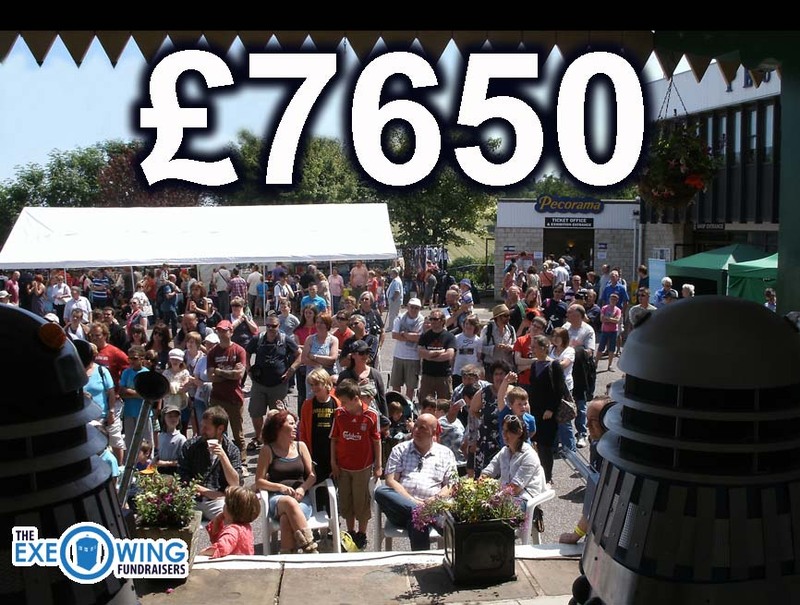 Have a go on the various Raffles, try your luck on the Tombola, there are loads of great prizes, including a full size fibreglass replica of a Cyberman Helmet and the biggest Ceramic Dalek ever! DEALERS. Assuming fine weather, the Traders will be situated on the lower forecourt in the marquee’s. Your chance to grab a bargain, all sorts of great items will be available to buy. PECORAMA. A visit to Peco wouldn’t be complete without a visit to the Model Railway Exhibition & Shop, a ride on the Miniature Steam Railway, Crazy Golf and a wander through the Beautiful Gardens, these are just some of the many things Peco has to offer. The day is held in aid of two charities: FORCE (cancer charity) and CRY (Cardiac Risk in the Young). There will plenty of photo opportunities, with three timed photo shoots. Several Traders will be attending on the day, selling a wide variety of merchandise, Toys, Collectables, DVD’s and much more. All situated above the stunning panoramic views of the East Devon Coastline, Pecorama itself is a joy to visit, with its Glorious Gardens, Miniature Steam Railway, Model Railway Exhibitions and many other attractions. Please find below directions to Pecorama, situated in Beer, a beautiful spot on the East Devon Jurassic Coast. BY CAR: Follow the brown official Tourist Board direction signs (stating ‘Pecorama’) from the Beer turning on the A3052, or from the sea front at Seaton. BY BUS: There is a useful bus service to Beer. X53 service travels from Exeter through to Weymouth and Poole, stopping off at Beer. No. 20 Stagecoach travels from Taunton to Seaton, then catch a local bus to Beer. Also there is a bus service from Sidmouth to Seaton, No. 899. For full details please telephone Devon Bus Service on (01392) 382800 or Traveline on 0871 200 22 33. BY TRAIN: The nearest train station to Pecorama is Axminster, being on the Waterloo-Exeter main line. The station is approximately 9 miles from us and you can either catch a bus or take a taxi. Taxis would need to be booked in advance – Axminster Taxis 01297 34000.